The Dadasaheb Phalke Award is the highest award of Indian cinema. It is given by the Government Of India. 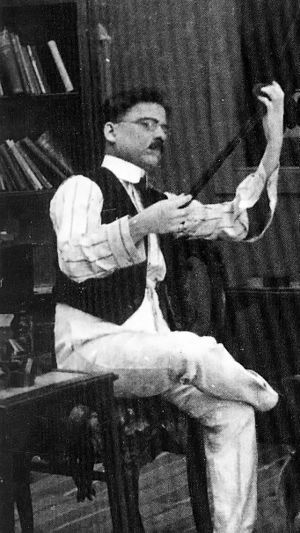 The award honours Dadasaheb Phalke's contribution to Indian cinema. Phalke is known as "The Father of Indian Cinema". The award is presented annually at the National Film Awards ceremony by the Directorate of Film Festivals. The award was instituted in the year 1962. The first recipient of the award was Devika Rani, who was honoured at the 17th National Film Awards ceremony. Actor Prithviraj Kapoor was the first recipient to be awarded posthumously. His son, actor Raj Kapoor, received the award in his father's place at the 19th National Film Awards ceremony. The great actor of Tamil cinema, world famous Sivaji Ganesan was awarded with Dadasaheb Phalke Award in the year 1992 on the 44th National Film Awards ceremony. Raj Kapoor received the award in 1987 and Shashi Kapoor, his brother, received the award in 2014. ↑ Agrawal, S. P; Aggarwal, Jagdish Chand (1997). In the Wake of Freedom: India's Tryst with Cooperatives. Concept Publishing Company. p. 269. ISBN 978-81-7022-656-7. ↑ "57th National Film Awards" (PDF). Directorate of Film Festivals. p. 17. Retrieved 21 July 2014. ↑ "58th National Film Awards" (PDF). Directorate of Film Festivals. pp. 14–15. Retrieved 21 July 2014.